What if I told you that the Cabernet Sauvignon you were drinking was really a red blend with at least 6 other grapes in it? What if I told you that the bottle labeled as Pinot noir on your table was also a blend? Not even a “red” one since it had Riesling, Gewürztraminer and Chardonnay in it? 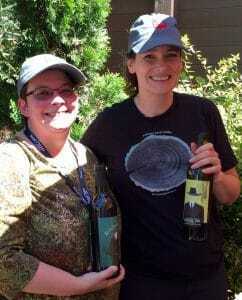 Or how about that bottle of Napa Valley wine which was actually made in Texas? Now to some degree, none of this really matters because blissful ignorance is truly blissful if you are enjoying the wine that you’re drinking. That is the blue pill of wine. But if you want to know the truth, lets take the red pill and look at some of the loopholes in US wine laws. The TTB (Alcohol and Tobacco Tax and Trade Bureau) provides a breakdown of the minimum standards for a wine label in the US. Let’s note some key details. This is the fallacy of the grape varietal snobs who drink “only” Cabernet Sauvignon. They think red blends are inferior wines made from the “left overs” and would never buy anything unless it says Merlot on the label. HA! Just kidding about that last one. The truth is that most red wines in the world are blends. Even if you want to discount many of the amazing European wines from Bordeaux, the Rhone, Tuscany, Valpolicella, Rioja, Douro, etc that have historically been blends, you still have this huge 25% loophole in American “varietal” wines that US winemakers are all to happy to exploit. My personal favorite of Ginny’s wines is the One-Armed Man which totally carries her “Peanut butter & Chocolate” pairing of Zin and Petite Sirah to rich, delicious perfection. Because blending helps winemakers make better wines. I remember listening to Ginny Lambrix of Zinfandel specialist Truett-Hurst talk about how she loves blending a little Petite Sirah with Zin. She found that the rich plums, blackberry and pepper spice of Petite Sirah married well with the similar flavors of Zinfandel. Of course, Zinfandel can make outstanding wines on its own and, yes, Petite Sirah can also make some great bottles. But putting the two together was like adding a little chocolate to peanut butter. Great by themselves but absolutely scrumptious together. Joseph Wagner developed a recipe for Pinot noir that, literally, hit the sweet spot of American palates. By blending in white wine grapes like Riesling, Gewürztraminer, Chardonnay, he added sweetness and made the wine softer. Yet with that 25% “other grape buffer”, he (and now Constellation Brands) could still market Meiomi as a Pinot noir. While there are many incredible 100% Pinot noirs out there, its clear that the blended grapes have been vital to Meiomi’s smashing success and growth. Yet I don’t know if anyone could credibly argue that Meiomi would have been anywhere near as successful if it was marketed as a Red(ish) blend. Only a true confectionery snob would say that the flour alone taste better than this blended creation. Likewise, the Lohr family has built a very successful brand for Cabernet Sauvignon with their Seven Oaks label. Yet nearly every single year they are just hitting that 75-76% minimum of Cab and rounding it out with other grapes. You have to give major props to the Lohrs for being transparent with their blends and tech data which is something that not many wineries do. You can tell that they’re proud of the wines they are making. But you better believe that they are certain that they will sell more wine labeled as Cabernet Sauvignon than they would if it was labeled as a red blend. That is my personal gripe about this loophole. I’m very pro-blend but it’s disheartening that wineries are basically rewarded for hiding that what they’re truly making are blends dominated by a particular variety. Now we should note that individual states can add their own conditions to tighten some of these laws. For instance, in Oregon a wine labeled as Pinot noir needs to be at least 90% of that grape. Though, curiously, 18 other grape varieties (such as Cabernet Sauvignon) are “exempt” from these stricter wine laws. So we’ve got a loophole for a loophole! The average price of a ton was over $4300 in 2015. To put that in perspective, 1 ton equals about 2 barrels or 50 cases of wine. This is just the base grape costs and speaks nothing to the cost of labor, winemaking equipment, barrels (new French oak barrels can cost over $3000 each), packaging and marketing. This is one of the reasons why it is hard to find Cabernet from Napa under $20. With your grape truck. On the roads between Napa and neighboring counties. When you go next door to Sonoma County, the cost for grapes is closer to $2400 a ton. Lake County clocks in at around $1600 a ton. You go to the southern Central Valley around Fresno and you can get a ton of grapes for around $300. Clearly there is financial incentive to offsetting the cost of production for your bottle of “Napa Valley wine” by using that 15% loophole of grapes grown elsewhere. But is it really still a “Napa wine”? That’s an interesting question but this loophole goes far deeper when you realize that that 15% could include grapes from places like Texas and Georgia. I’m not kidding y’all. 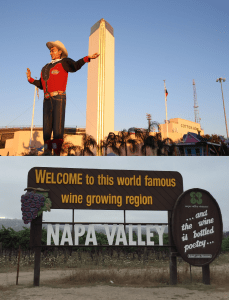 To be fair, I think Napa stole the idea of erecting big signs from Texas first. The TTB is currently holding a comment period over a particular loophole. This one allows a winery to buy fruit from outside their state, truck it into their state and maybe even blend it with local fruit, but still label it under the AVA where the 85%+ of the fruit came from. The only restriction is that they only sell the wine within the winery’s home state. So, yes, a winery in Texas can buy Napa Valley fruit, blend in 15% of Texas fruit, and still sell it as a Napa Valley wine to the wine shops and restaurants of Texas. The comment period for discussion will run till December 7th, 2016. If you want to indulge in some not-so-light reading, you can take a look at the comments already submitted. I’m going to bet on the law being changed and this loophole getting closed. But there are still plenty of other loopholes to trip over. Maybe we should sit back and chase down our blue pills with a little $20 Napa Valley Cabernet Sauvignons. Tagged J. Lohr, Meiomi, Red Blends, Truett-Hurst, TTB. Can Wine in a Can Really Take Off?